We released our quarterly roundup of the top performing ads based on Breakthrough ability, as well as quantifiable levels of humor and storytelling. 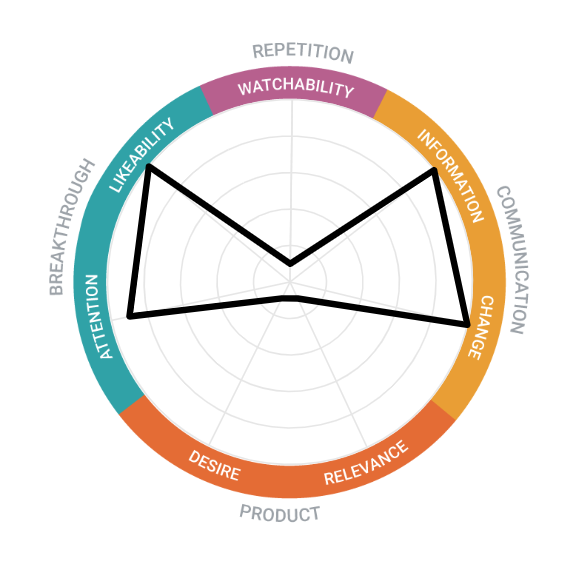 The Breakthrough list is derived from a combination of Attention and Likeability components, whereas the other lists originate from two of the 57 emotional metrics we evaluate for every ad, Funny and Narrative. 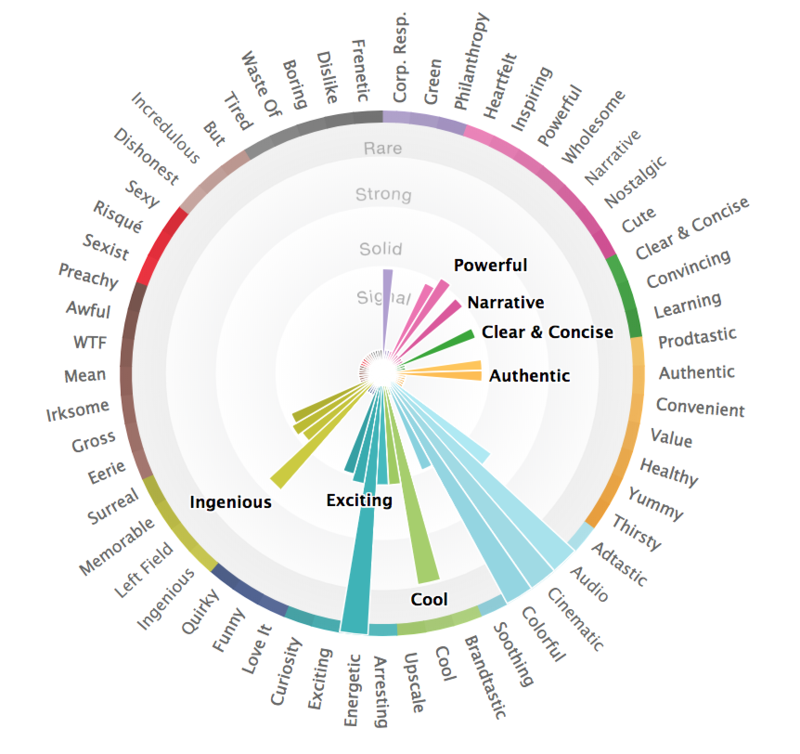 The methodology for this groundbreaking emotional measurement is based on Natural Language Processing and machine learning analysis of hundreds of viewer reactions to every ad – in their own words. 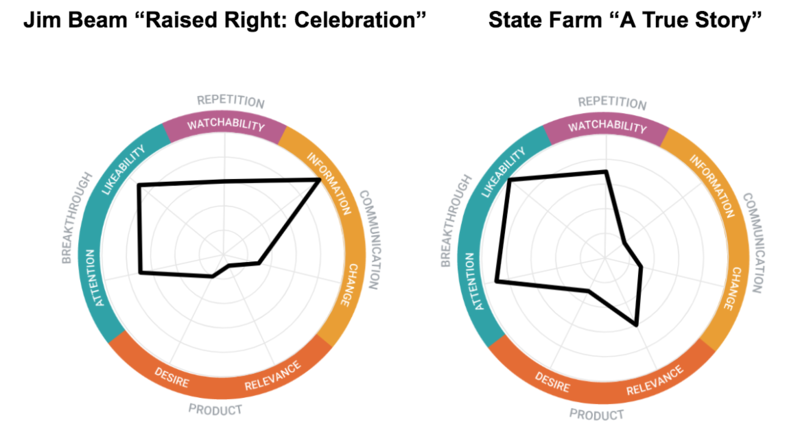 The strength of each of the fifty seven emotions is evaluated relative to all other ads in our database, totaling over ten million verbatims, to determine whether an ad is hitting it out of the park or missing the mark. With over 1,900 ads tested in Q1, the top ten represent the ads with the most powerful Breakthrough potential. A recut of its Super Bowl ad, “My Order” from Amazon played out Harrison Ford’s story about an Alexa device for pets gone hilariously wrong. Also one of the funniest ads in Q1, Ford’s star power, which contributed to the Characters being selected as the Single Best Thing by 36% of viewers, entertained viewers and boosted the ad’s Breakthrough power. Sherwin-Williams brought color to life with an animated, striking display of paint chips in “Hide and Seek.” As shown in the emotional profile below, the production quality and creative execution engaged viewers the most, with gut reactions relating strongest to our visceral emotional metrics, including Audio, Cinematic, Colorful and Energetic. The immersive illustration of the product sparked Desire in viewers, with 57% reporting positive purchase intent. 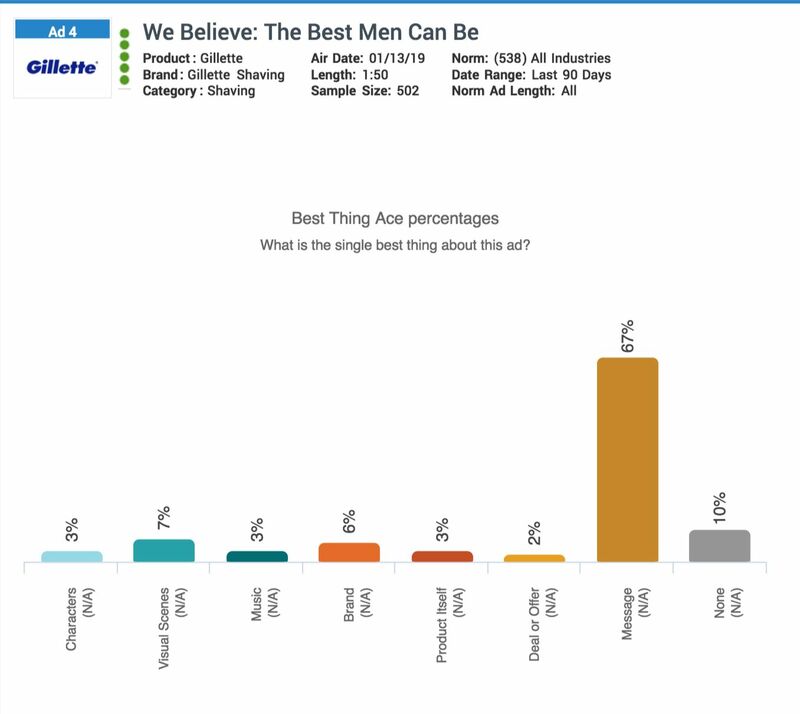 Fifth on the list is Gillette’s controversial ad, “We Believe: The Best Men Can Be”. As our data revealed when it first aired, the social media backlash represented a small minority of overall opinions. When viewed in full, consumers were receptive to the Message, named the Single Best Thing by 67% of gen pop viewers. On top of that, 65% reported they were more/much more likely to purchase after viewing while only 8% said they were less/much less likely. Bob Dylan’s “Blowin’ in the Wind” paired perfectly with the green messaging in the long-format version of Budweiser’s Super Bowl spot, “Wind Never Felt Better.” The Dalmation immediately grabbed eyes, but the music and the visuals captivated viewers throughout. All three of those Attention-grabbing elements plus the renewable energy message were well received, contributing to the ad’s strong Likeability score and Love It and Adtastic reactions from viewers. Holland America Line earned the seventh spot on the Breakthrough list with an ad dedicated to all the wonders Alaska offers its visitors. The cinematic and soothing effect of the visuals drove Desire among viewers, resulting in strong resonance across current and lapsed customers as well as brand considerers. Finally, another Super Bowl spot wrapped up the list. In “The 100-Year Game,” the NFL celebrated its 100th year in epic proportions with some of the most recognizable faces from the league, including Marshawn Lynch and Tom Brady. 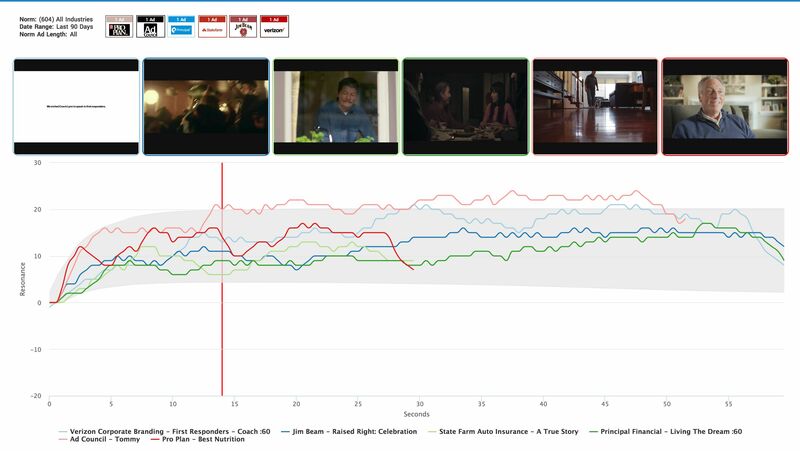 Despite being a lengthy 2:00, viewers were entertained, scoring the creative above Super Bowl advertising norms on Watchability (I’d watch it again). Humor is found in 25% of the ads in the Ace Metrix database, but less than 1% evoke the level achieved by Q1’s funniest ads. Each of the ads above stirred up a combination of funny, quirky, and unconventional emotions among viewers, signaling more offbeat humor was used. All five were seen as entertaining, scoring strongest on the Attention and Likeability components followed by Watchability. The Characters were the source of comedic delivery in all the ads and were identified as the Single Best Thing about each, save for Snickers where the Product Itself stood out the most to viewers. Snickers put a twist on its “You’re Not You When You’re Hungry” message when promoting its new creamy nut butter product line. Food close-ups triggered the Pavlovian response in many viewers, making Desire one of the key creative drivers. The silly humor in “Meal Break” marches to the same beat as many Geico ads before it. Not only was it the most Quirky of the top five, but it also ranks highest on that emotional measurement for all of 2019, thus far. Last in the top five is the only Super Bowl spot that ranked among the funniest. Michael Bublé’s appearance in Bubly’s “Can I Have a Bublé?” was also seen as clever and earned the spot a ranking among the most ingenious Super Bowl 53 ads. 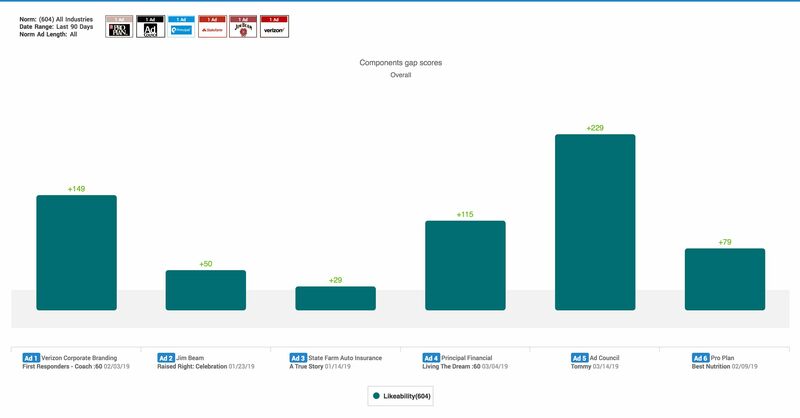 The power of the story, measured by the Narrative emo, is present in 13% of ads in the Ace Metrix database, but the following ads achieved a standard of storytelling that is on par with less than 1% of all ads in the database. Second-by-second trace, shown below, revealed engagement levels slowly built throughout most of the ads, with some dips and spikes synced with each story arc. Shelter Pet Adoption and Ad Council’s “Tommy” saw the strongest uptick in engagement from the start, putting that creative’s resonance above all the others. The Message that’s unveiled with each ad’s storytelling was identified as the top Single Best Thing for five of the ads. However, for Purina Pro Plan’s “Best Nutrition” the Message took a backseat to the story’s Characters, most notably the Bichon Frise, and the Visual Scenes. While younger generations appreciated the heartwarming tale of change portrayed in Principal Financial’s “Living The Dream,” the creative related best to those ages 50 and up as the main character came off as a reflection of where they are at in terms of retirement planning. Congratulations to all of 2019 Q1’s top ads recognized for Breakthrough, Humor and Storytelling!